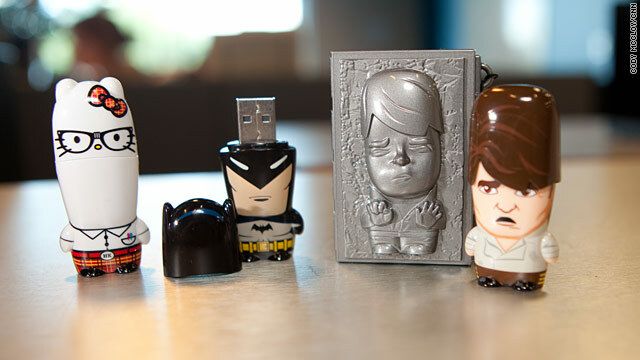 Hello Kitty, Batman and Han Solo (with carbonite carrying case) are some of the USB drives MImoco has available. When it comes to USB drives, is it fun over function? When you are passionate about a franchise like “Star Wars” or “Batman” you can find ways to show your fandom in every part of your life: clothes, coffee cups, mouse pads, etc. Mimoco has tapped into that with their line of Mimobot USB drives – available in several styles to meet many differing fandoms. Mimoco's drives are some of the coolest out there, and they just released a new series licensed from Lucasfilm and DC Comics at San Diego Comic-Con. As the price of flash drives have plummeted, vanity and promotional versions have flourished. In 2007 Mimoco sent CNN.com one of their original, limited edition drives featuring Han Solo. I remember thinking how cool it was, but that it was way too expensive – priced at $70 for the 1gb version. The current line run about $30 for the 4 Gb version – which is far more approachable for your average consumer. Of course my problem with USB drives of any sort is, that while I love them, I constantly lose them, which means I don't want to spend a ton of money on them. My current favorite is a SanDisk Ultra 16 GB. It has a keyring on it (so it's attached to my keys, which I hope I don't lose!) and the USB connector retracts, so there's no cap to misplace. I chose it for these features and because it was on clearance for about $25. So while I think these Mimobots look amazing, I'm not sure how much use I'd get from one before it went the way of so many of its predecessors and disappeared into that great junk drawer in the sky. Granted you can get a "hoodie" case with a clip on it for your Mimeobot ($5.95 on their site) which would allow you to you clip it to your bag or key chain or whatever, but then you have to take it at least part way out of the case to use it. And you still have that cap to lose. But then there's the fact that they look great sitting amongst the other toys that litter my desk at work. And many people will want them because of that fact alone – the pure cool factor of having a cool USB drive with an awesome design - and for that I can't fault Mimoco. What do you look for in a USB drive, and how important is style in that decision? Of course, the better question might be - if it looks cool, and it reflects a passion - how important is its actual function? The novelty of them is great! The soundbyte functionality not so much for the mac user. Mimobot has reported problems with their soundbyte software which doesn't work on the Mac. An update to their software was allegedly in the works. The wait is going on over a year. The support page has been removed off of the Mimobot site. The forum thread which users were using to report and track the problem has also been removed. Cute, yup, and that makes them very enticing to thieves. My local Starbucks now has a note posted about a "lost" novelty shaped USB drive...containing the poor schmuck's graduate degree thesis. The only good USB drive, are the ones companies give away for free. While I think the USB drives can be cute, I go for function over form, and I don't just mean your basic USB keys. I have three SwissMemorys and recently bought my husband an IronKey. All completely overpriced USB memory, but the extras make it worthwhile to me. The SwissMemory USB still works fine in my originals. The 256mb key is a bit small these days, and the scissors broke. (I know you can get replacement scissors, but I do not appear to be skilled enough to replace them.) The 1gb key is fine, but its attached knife is dull and I wanted a flashlight one, so my third is red and 16gb. I'm hoping my husband will like his IronKey. I've only lost one flash drive, and that was from a burglary (they got two computers and other stuff as well). Do you lose your car keys, too? As to "fun" and "function", Yeah, if a 16 gig Han Solo drive was a dollar more than a 16 gig normal drive I'd buy one, but at the prices they're charging, well, they're not much better than the people who broke down my door and stole my stuff. Duh, yeah, it's form over function with flash drives. They're kind of just a novelty already. There are a number of free cloud services that you can store data on and access them from any computer, and most of us who are keeping track of important files have a couple of dedicated external hard drives. Flash drives are what I use to send to prospective clients or employers as a mini-portfolio. You can have a printer personalize them for you for a reasonable price, and it's still impressive to get one along with a resume. The only reason for me, personally, to buy a flash drive is for presentation purposes, or if I find something sufficiently geeky enough to make me want to have it even though I don't really need it for anything. I love those Mimobot flash drives but can never bring myself to pay what they want for them. My flash drive that I got for free gets thrown in my bags, has been stepped on a few times and looks like it's been through hell. But it still works. If you did twist my arm for the Mimobot though, I'd get Batman–no questions asked.